Raise your hand if you like brussels sprouts! Okay, so if you didn’t raise your hand, you are not alone. And, I challenge you, to just stick around for a bit, because I think, this recipe for Roasted Brussels Sprouts just might change your mind. 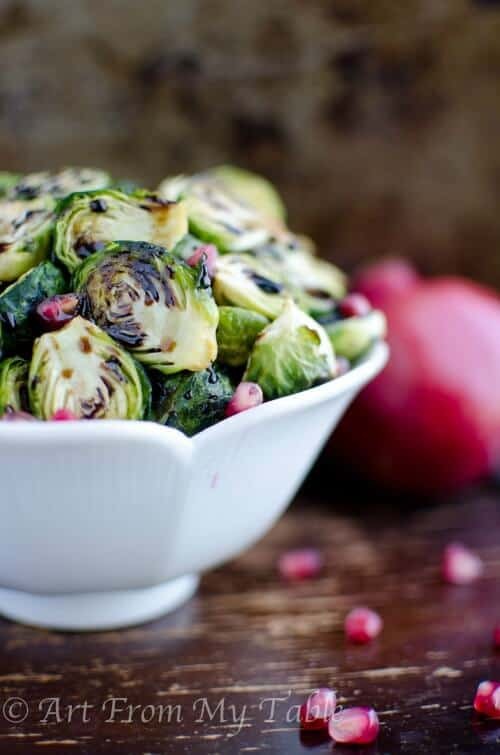 Okay, you brussels sprout haters~ I’ve got a story for you. Last year, my husband planted a brussels sprout plant in our garden. I was like… whatevs… thinking, I’m not really so crazy for brussels sprouts. I figured he’d just eat them all and the kids would at least try it. side note for those of you with picky eaters– have your kids try one bite, just ONE bite! We have implemented this all along for our kids with great results. We told them, you don’t have to like it, you just need to try it. There’s a great Daniel Tiger episode that sings a song… “you gotta try new foods ’cause they might taste good!”. This little song has really stuck with our kids and they are willing to try everything. So guess what? Our garden FAILED! Miserably failed. We got nothin’! No tomatoes, no cucumbers, no peppers, no beans, no basil. It was quite disappointing. However, we did get ONE thing… yup brussels sprouts! But, they weren’t really showing up during the harvest. Fast forward to Thanksgiving. My husband notices some brussels sprouts on the bush as we went outside for something. So he picks them. And we have brussels sprouts with our Thanksgiving dinner! What?? The best part was this balsamic glaze that he whipped up to serve over the Roasted Brussels Sprouts. It has changed my view on this vegetable. The kids even tried them, AND LIKED THEM. They were asking for more. Unfortunately our plant only yielded about 15 brussels sprouts, so there were no seconds. 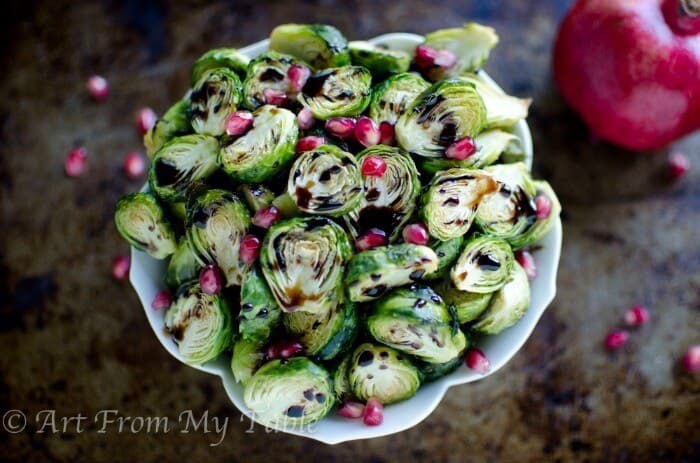 Truly I think what ‘made’ this recipe is the combination of roasting the sprouts, and the balsamic pomegranate reduction, which makes a lovely glaze. Roasting brings out a fantastic flavor. The glaze is sweet and tangy. And don’t be put off by “reduction”. It’s so simple and you can sound like a gourmet cook! Still skeptical? Just try one bite. Really! Just one little Roasted Brussels Sprouts! Come back and let me know what you think. And for you brussels sprouts lovers? 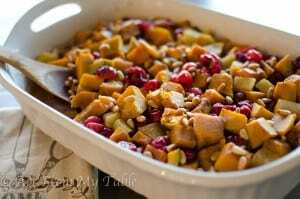 Well, you are going to LOVE this recipe! Let’s talk about “reduction” or reducing your sauce. All you’re doing is reducing, or cutting down the amount of sauce by boiling it. Sounds simple, and it is, but magic happens! The magic is, it gets a little thicker, like a glaze, and it will cover the back of a spoon. That’s how you know it’s done. It also intensifies the flavor. One more thing, as your reduction cools, it will get thicker and stickier. Just warm it a bit slowly on the stove again and it will loosen right up. If it’s left overs your re-heating, the microwave will work, just about 20 seconds is all you need. Prepare your brussels sprouts. Cut off very bottom of the stem if necessary. Pull of any wilted or loose leaves, slice in half lengthwise. Toss them in a couple tablespoons of olive oil and place on a rimmed baking sheet. Bake for 20-25 minutes until slightly golden. Meanwhile, combine the vinegar, sugar and pomegranate juice in a small saucepan. Bring to a boil, then turn it down just a bit so it's still boiling. Reduce to about a half of a cup. Once it's reduced, set aside. 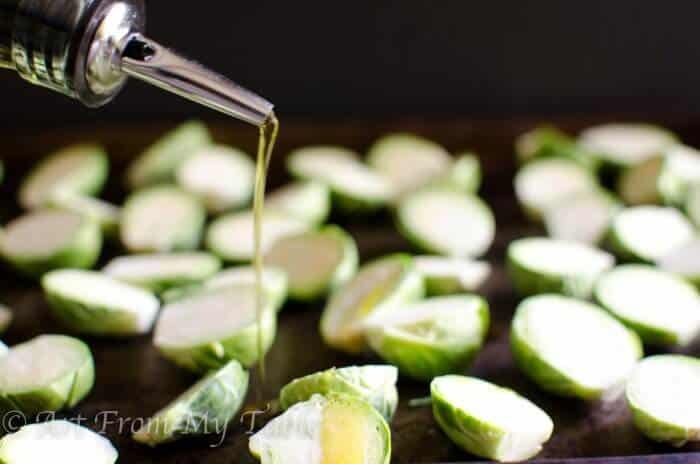 Serve the Brussels sprouts with the glaze drizzled over top. Want free recipes delivered to your inbox? Sign up for my newsletter! You’ll even receive a FREE copy of my cookbook~ Family Favorites. Thanks Julia! Glad to hear it! Brussels sprouts are my fav!! We eat them several times a week….roasting is the best. 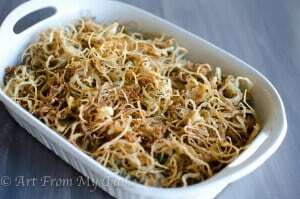 I love your recipe and will give it a try! Yummed, Stumbled and Pinned! You have a pomegranate tree? Lucky!! Thanks for commenting on all of my links Audrey, really sweet. And good luck on the brussels sprouts! Brussel sprouts are one of my favorite vegetables I make them regularly. I have purchased pomegranates three times and tossed them before I figured out how to use them. I will purchase them again and toss some in along with the juice, I am trying this very soon. 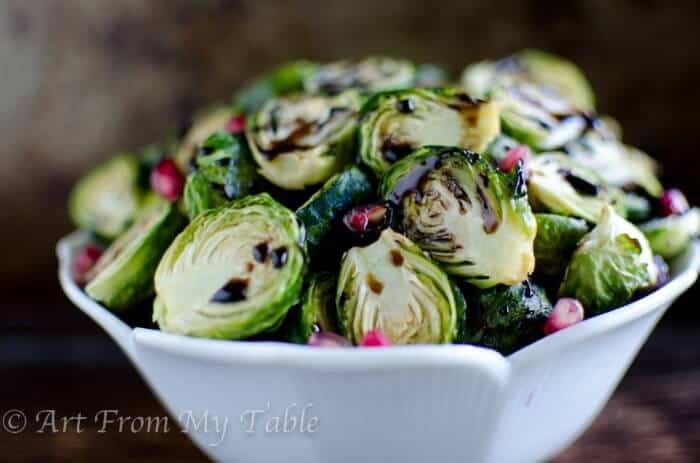 I really love Brussels sprouts, but I’m a terrible gardener, haha, so I have to stick to farmers market or store-bought, but this recipe looks great!! Pinning. I love brussels sprouts fixed just about any way. Can’t wait to try this recipe. Thanks for sharing your recipe at Funtastic Friday. Love roasted brussels sprouts. They look good! 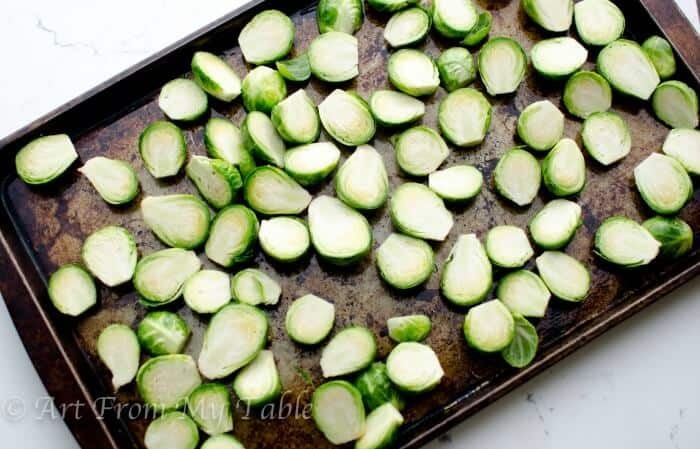 I often roast brussels sprouts, but the glaze sounds delicious! Just letting you know I will be featuring your recipe at Best of the Weekend! I like Brussels sprouts and these look especially yummy. 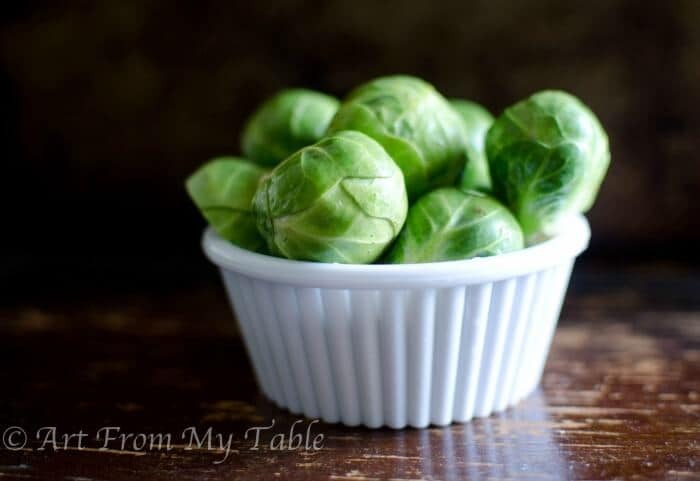 I’ve been getting into brussels sprouts lately and this will be the perfect recipe for Christmas Eve dinner. Thanks!